The treaty is the successor to a series of agreements negotiated between the British Raj and the Kingdom of Nepal. The treaty is the successor to a series of agreements negotiated between the British Raj and the Kingdom of Nepal through the 19th and early 20th centuries. The intimacy and intensity of the relationship between the people of Nepal and India, Prime Minister Narendra Modi suggested in his speech to the Constituent Assembly in Kathmandu, can’t be measured by “pieces of paper” signed by the governments of the two countries. The PM’s reference to “pieces of paper” was not a rhetorical device. It referred to the 1950 “India-Nepal Treaty of Peace and Friendship” between the two governments, which is supposed to codify the special relationship between the two countries. The treaty is the successor to a series of agreements negotiated between the British Raj and the Kingdom of Nepal through the 19th and early 20th centuries. The Nepali elite sees the treaty as unequal and the symbol of Indian “hegemony” over Nepal. New Delhi, on the other hand, points to the unique benefits that Nepalese people enjoy in India, including national treatment, an open border and vast employment opportunities. Delhi also points to the fact that all provisions that favour India in the treaty have long gone into disuse; and that the treaty’s inequalities are all in favour of Nepal. Recognising, however, that the treaty had become a lightning rod for anti-India sentiment in Nepal, the Atal Bihari Vajpayee government agreed, nearly a decade and a half ago, to jointly review its provisions with Kathmandu. Delhi has since complained that Nepal’s leaders publicly raise the demand for a treaty review, but do not come up with any specific suggestions on how. Put simply, the treaty has become a device for Nepal’s leaders to posture against India, without ever taking the responsibility to suggest its revision. The PM appears to have taken the treaty bull by the horns. He reportedly told Nepal’s prime minister, Sushil Koirala, “You can do exactly what you want with this treaty. You can remove it, you can change it. Come up with a proposal and I will accept it.” Reports also suggest that Modi was eager to have a new treaty in place before the end of his five-year tenure as PM in 2019. In his address to Nepali leaders at the banquet given by Koirala, Modi urged them not to make the treaty a political issue and invited them to bring forward ideas to recast it. The joint statement issued at the end of Modi’s visit said, “the two prime ministers agreed to review, adjust and update the Treaty of Peace and Friendship of 1950”. The two sides also agreed that “the revised treaty should better reflect the current realities and aim to further consolidate and expand the multifaceted and deep-rooted relationships in a forward-looking manner”. That the ball is in Nepal’s court was confirmed by the joint statement, which said that Kathmandu has “agreed to provide at the earliest” specific proposals on revising the treaty. Former French President Charles de Gaulle had famously said that “treaties, you see, are like roses… they last while they last”. Covenants and other formal agreements between nations are the product of a specific historical circumstance. When the context, domestic and external, that produced the pact changes significantly over a period of time, there will be little incentive to abide by its terms. 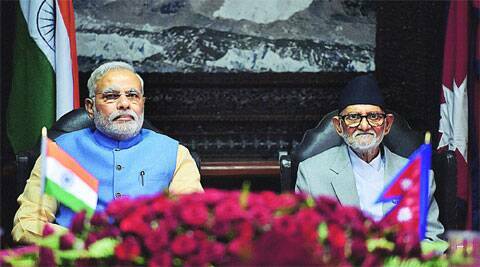 Whether Kathmandu wants it or not, it is in Delhi’s interest to revise the treaty with Nepal. Delhi certainly needs a new compact with Kathmandu that has strong political support in Nepal and provides a sensible basis for mutually beneficial engagement in the new 21st century. The 1950 treaty was concluded at the request of Nepal, whose rulers were frightened by communist China’s advance into Tibet. India, as the successor to the Raj and its legacy of protecting small states in the subcontinent and beyond, stepped in to support Kathmandu. Nepal has long stopped seeing China as a threat and many aspects of the bilateral security cooperation have lapsed. Nepal is now a democracy and its leaders are acutely conscious of national sovereignty. As it waits for specific proposals from Kathmandu, Delhi on its own must imagine and debate the contours of a new strategic partnership agreement with Nepal that is rooted in the principle of sovereign equality and deepens security and economic cooperation between the two countries on a pragmatic basis.